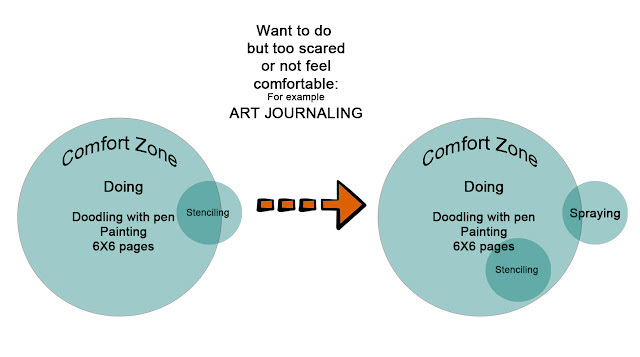 scrappin it: How to Step Out of Your Creative Comfort Zone? How to Step Out of Your Creative Comfort Zone? You've seen inspirational quotes that encourage you to get out and do something new, something you wouldn't normally do. But getting out of your routine just takes so much work. There's actually a scientific explanation to why it's so hard to break out of your comfort zone, and why it's good for you when you do it. 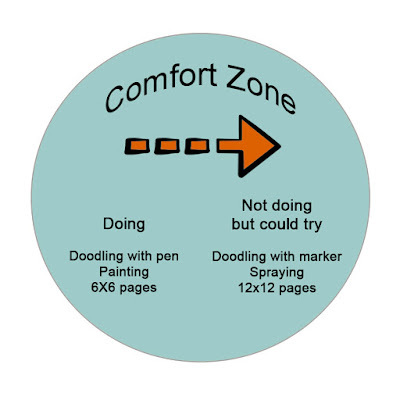 Our comfort zone is a behavioral space where our activities and behaviors fit a routine and pattern that minimizes stress and risk. It provides a state of mental security. We benefit in obvious ways: regular happiness, low anxiety, and reduced stress. 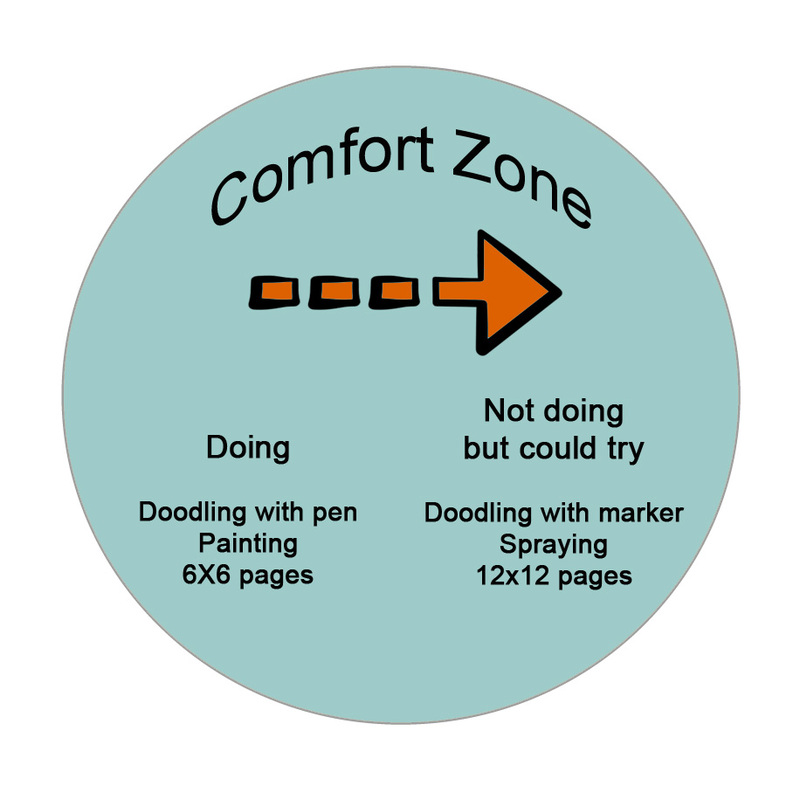 Our comfort zone is neither a good or bad thing. It's a natural state that most people trend towards. Leaving it means increased risk and anxiety, which can have positive and negative results. 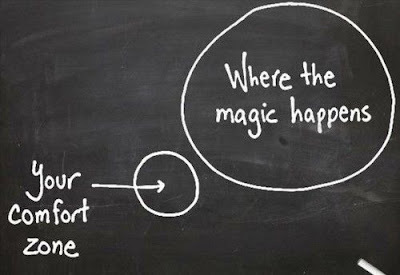 Don't think your comfort zone is something that's holding you back. We all need that place where we're least anxious and stressed so we can process the benefits we get when we leave it. What do you really get when you're willing to step outside of your comfort zone? * You'll be more productive: comfort kills productivity because without the sense of unease that comes from having deadlines and expectations, we tend to do the minimum required to get by. We lose the drive and ambition to do more and learn new things. * You'll have an easier time dealing with new things. 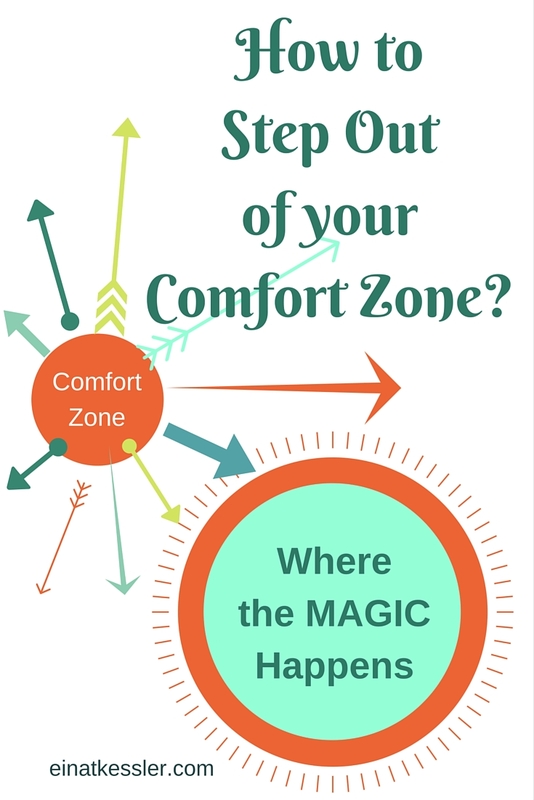 By taking risks in a controlled fashion and challenging yourself to things you normally wouldn't do, you can experience some of the uncertainty in a controlled, manageable environment, which will help you try new things. * You'll find it easier to push your boundaries in the future. Once you start stepping out of your comfort zone, it gets easier over time. * Do things differently: if you art journal with a pen try a marker, or if you create scrapbook pages with one photo try two or three. Make small changes that will be different but not outside your comfort zone. * Do it in small steps: Don't start an entire 12x12 full scrapbook if you only did three 6x6 pages and don't buy 30 sprays if you haven't tried spraying even once. First identify your fear, what is the thing you want to try but afraid to and then face it step by step. Break that something new into small bits. For example instead of creating a mixed media art journal page, start by stenciling on a piece of scrap paper. Practice it a few times and when you get comfortable with that add another step like using spray and/ or paint. 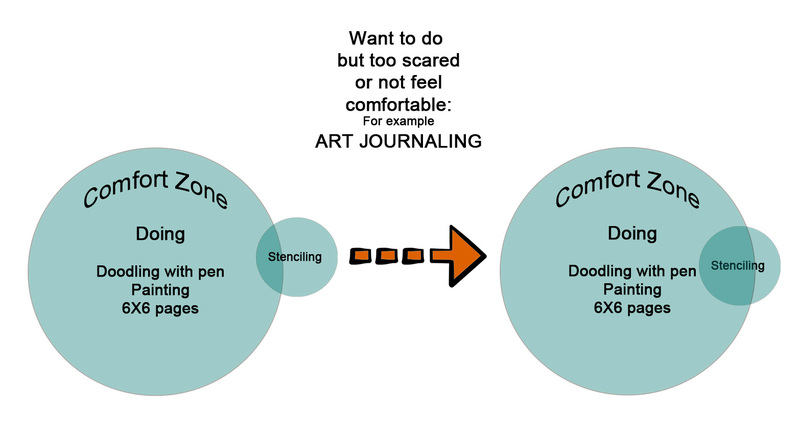 Each time you feel comfortable with a step add another this way you'll stretch your comfort zone and before you know it art journaling will be inside the "zone" and not outside. your journey with people like you. 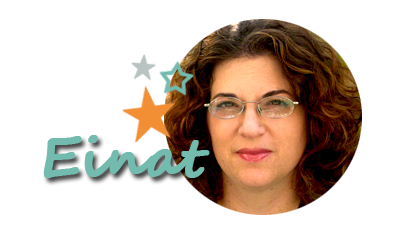 From a personal point of view I can say breaking or stretching my comfort zone was not easy. When I started mixed media for example I had no idea what to do or how. I started looking at what other artists do, what supplies they use and what techniques and I started experimenting. I tried a different technique or material every time until I was comfortable enough to start creating full mixed media projects. And when I was comfortable with that I started sharing my projects.